Optional: Enter the message you'd like written on the back of the clock. 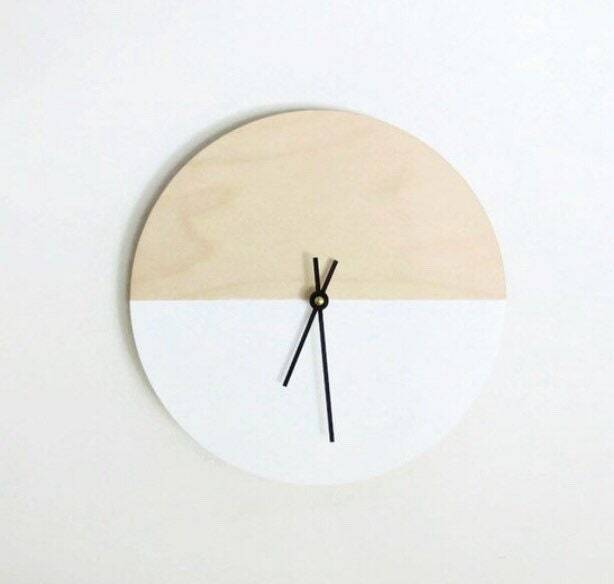 Add this modern wall clock to your decor for a clean, modern look. The wood base is made using reclaimed wood, making this a eco friendly option for your timing needs. Whether you hang this clock in your home, office, or gift it to someone special, it’s sure to please. This clock makes a great gift for any occasion. The back of the clock is a perfect spot to write a personal message to the recipient. Please leave a message in the "Personalization" section if you would like me to write a message on the back for you. This is a Shannybeebo Clocks original design and can be personalized using your favorite colors. Order now to ensure availability! Clock size shown 12” x 3/8” thick. 10" clocks will be 1/4" thick. Assembled with a new quartz movement. There's a heavy duty hanger on the back for hanging. Requires 1-“AA" battery (not included).